10cc songwriter and musician, Graham Gouldman formed what became Heart Full of Songs six years ago, purely for the pleasure of playing songs in their simplest form, acoustically. Backed by fellow 10cc band members and opening the show at 10cc concerts, Graham performed a selection of hits he wrote for other artistes. The format became so popular that it adopted a name and undertook its first stand-alone concert tour in 2013, touring again the following year. Much has happened for Graham since he last took the band, now a three-piece featuring Iain Hornal and Ciaran Jeremiah, on the road. His status as one of the world’s leading songwriters was acknowledged with his induction into the Songwriter’s Hall of Fame at a special ceremony in New York. America’s Broadcast Music Incorporated followed suit and anointed him an Icon of the Industry at a special ceremony in London, where he stunned the audience with an acoustic rendition of ‘I’m Not In Love’, accompanied by Lisa Stansfield on vocals. Graham played with various Manchester bands before forming The Mockingbirds in 1965 (with Kevin Godley on drums), and when the record label Columbia rejected Graham’s first single composition for the band, it turned out to be a blessing in disguise. The song, ‘For Your Love’, became a huge hit for The Yardbirds. Working by day in a men's outfitters shop and playing by night with his band, Graham went on to write a string of hits, such as ‘Pamela, Pamela’ for Wayne Fontana, ‘For Your Love’, ‘Evil Hearted You’ and ‘Heart Full of Soul’ (The Yardbirds), ‘Bus Stop’ and ‘Look Through Any Window’ (The Hollies), ‘No Milk Today’ and ‘Listen People ‘(Herman's Hermits) and ‘Tallyman’ for Jeff Beck. In 1972, along with Eric Stewart, Kevin Godley and Lol Creme, Graham formed 10cc and enjoyed a string of Top 10 hits, including three No 1s – ‘Rubber Bullets’, ‘I’m Not In Love’ and ‘Dreadlock Holiday’ – along with ‘Donna’, ‘Art For Art’s Sake’, ‘The Things We Do For Love’, ‘I’m Mandy Fly Me’ and ‘The Wall Street Shuffle’. Graham Gouldman and his band will play all these hits and more at The Apex on Wednesday 4 October at 7.30pm. 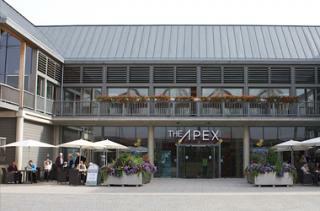 Tickets are £24.50, ring the box office on 01284 758000 or see the website, www.theapex.co.uk for details.